Fresh Five. Five things to bring on your next trail run. I hit the trails today behind my house for some glorious trail running. We are very fortunate to have a small mountain range behind our house with some neatly cut trails that are used for snowmobiling in the winter. On an incredibly clear day there are places at the top where you can see Franconia Notch, the Presidentials, and even Mount Washington. We feel pretty lucky to live in such a beautiful place. 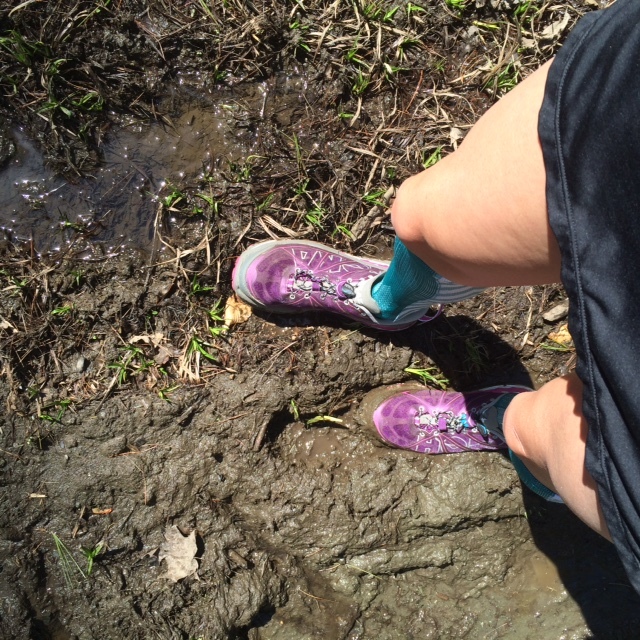 I am still learning my way around the trails and have to admit that I am sometimes afraid to run them by myself for fear of running into a bear (we saw huge bear paw prints in the snow earlier this spring). I always joke that my internal compass is completely broken and I tend to easily get lost but I am making it my goal to learn the trails this summer and to run them at least once a week! As I was running I began thinking about what I try to bring with me when I go trail running to help you get started with trail running fun! It’s time for some trail running! 1. A great pair of trail shoes. My current go to trail shoe are the Hoka One One Stinson ATR. Yes, I have jumped on the Hoka One One bandwagon and am so happy about my decision. This shoe has an extremely rugged soul with great treads perfect for clambering over rocks, sticks, through the mud and more. I am loving the stability of this shoe with its wider platform. When I am wearing these shoes I feel like I can run over anything! 2. Compression socks. These are a definite must at this time of year or at least a mid calf sock because tick season is here. Tall socks are a great guard against those gross little Lyme carrying bugs because they especially like hitchhiking on your ankles. I get the heebie jeebies just thinking about ticks. 3. A Map. I always carry my trusty iPhone in the pocket of my Skirt Sports and have needed to use google maps on more than one occasion to find my way home. If you are in an established trail system find out if they have a trail map that you can carry. 4. A Hydration Pack. I forgot to carry mine today but a hydration pack is great not only for quenching your thirst but also for carrying your goodies for refueling (Skratch Labs fruit drops) and other things like your car keys, your map, and your phone. My favorite hydration packs are made by Camelbak and UltrAspire. 5. A sense of adventure. You never know what will happen on a trail run, you might encounter some wildlife (today I almost jumped out of my skin when a deer rustled past me in the woods). Going for a trail run on a new trail system is kind of like a “Choose Your Own Adventure” story, you never know where a new trail will take you but the adventure of finding out is totally worth it. Time to get muddy on the trails. Trail running at its best! 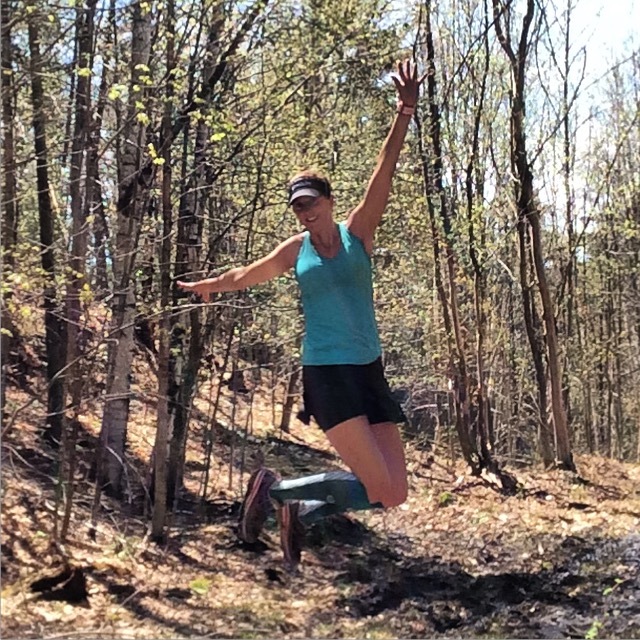 Are you a trail runner? What would you bring on a trail run? Tell me about your favorite trail to run on! i think bug spray usually tops my list for trails!! 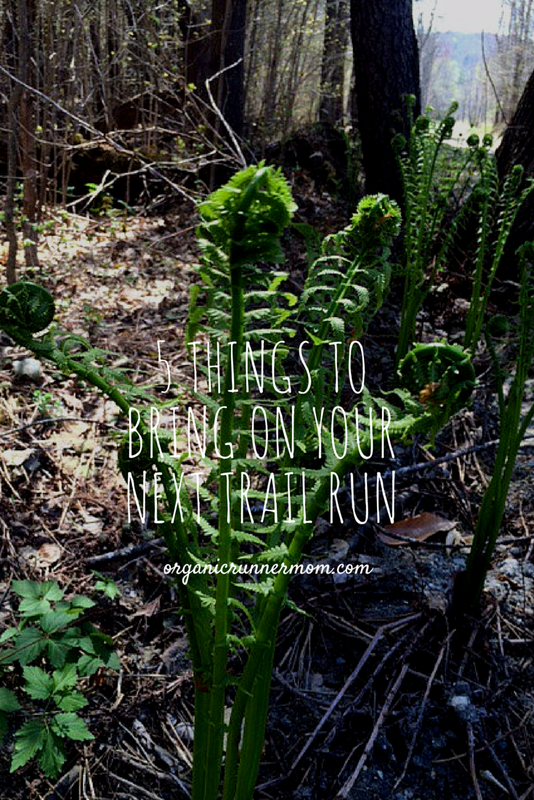 All are great things to bring on a trail run! Great tip on the compression socks due to tick season, I will have to start as it’s pretty bad here in Jersey too! Love the sense of adventure, we saw a deer run across the trail ahead of us today on our walk this morning. I’m not a trail runner, but we like to walk trails with the kids (used to hike them pre-kids!). Water and snacks are always with us! I’ve never been on a trail run, but seems fun! Great tips if I ever do! Well, I have the shoe and sense of adventure part down! I know I should do something to protect against ticks, though, b/c the deer population is rampant around here. 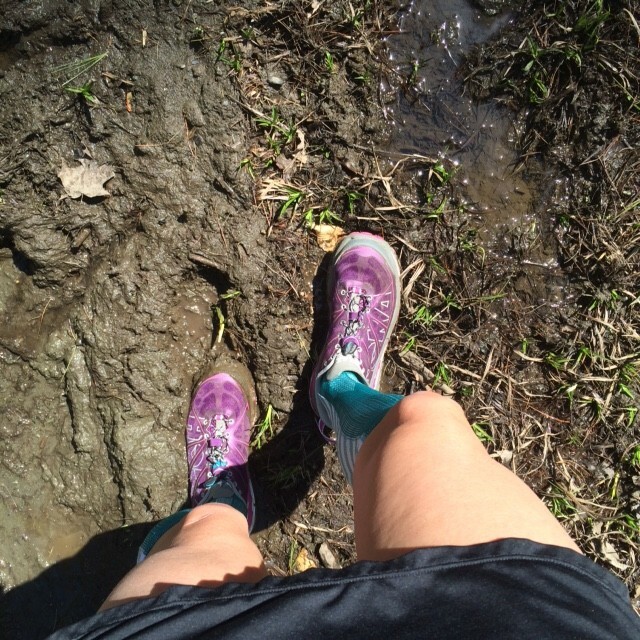 Trail running is my very favorite and can’t wait to get in a few races over the summer. I don’t get the opportunity to run a lot of trails living in a big city, but the few times I have been trail running, I loved it. It’s so peaceful! I think #5 is probably the most important! I’d love to do trail runs, but living in the suburbs, my trails are all pavement! Your trail runs sound ideal, I have never done one and think I will need to try one soon. Thanks for the tips! I really want to start trail running! Up here in Alaska we don’t have ticks…but we do have lots of bears! So I’m pretty afraid of trail running alone. I love Hoka’s! I have the same ones too! I don’t trail run (seriously), but I do occasionally pass through a few on some of my Saturday runs. I do want to start trail running more! I am not a trail runner and not sure I will ever be unless I can find someone to do it with me! Thanks for sharing these tips if I ever do trail run! A hydration pack is a must! You never know when you’ll need water, and how much water will be available out on the trail. I wish that I had trails nearby to run!! But if I did, bug spray would definitely top my list!